The .50 Browning Machine Gun (.50 BMG, 12.7×99mm NATO and designated as the 50 Browning by the C.I.P.) is a cartridge developed for the Browning .50 caliber machine gun in the late 1910s, entering official service in 1921. Under STANAG 4383, it is a standard cartridge for NATO forces as well as many non-NATO countries. The cartridge itself has been made in many variants: multiple generations of regular ball, tracer, armor-piercing (AP), incendiary, and saboted sub-caliber rounds. The rounds intended for machine guns are made into a continuous belt using metallic links. John Browning had the idea for this round during World War I in response to a need for an anti-aircraft weapon, based on a scaled-up .30-06 Springfield design, used in a machine gun based on a scaled-up M1919/M1917 design that Browning had initially developed around 1900 (but which was not adopted by the U.S. military until 1917, hence the model designation). Armor-piercing incendiary tracer (APIT) rounds were especially effective against aircraft, and the AP rounds and armor-piercing incendiary (API) rounds were excellent for destroying concrete bunkers, structures, and lighter armored fighting vehicles (AFVs). The API and APIT rounds left a flash, report, and smoke on contact, useful in detecting strikes on targets. The development of the .50 BMG round is sometimes confused with the German 13.2 mm TuF, which was developed by Germany for an anti-tank rifle to combat British tanks during WWI and against aircraft. According to the American Rifleman: "Actually, the Browning .50 originated in the Great War. American interest in an armor-piercing cartridge was influenced by the marginal French 11 mm design, prompting U.S. Army Ordnance officers to consult Browning. They wanted a heavy projectile at 2700 feet per second (f.p.s. ), but the ammunition did not exist. Browning pondered the situation and, according to his son John, replied, 'Well, the cartridge sounds pretty good to start. You make up some cartridges and we'll do some shooting.'" The American Rifleman further explains that development was "[r]eputedly influenced by Germany's 13.2x92 mm SR (.53-cal.) anti-tank rifle" and that then "Ordnance contracted with Winchester to design a .50-cal. cartridge. Subsequently, Frankford Arsenal took over from Winchester, producing the historic .50 BMG or 12.7x99 mm cartridge. The Army then returned to John Browning for the actual gun. Teamed with Colt, he produced prototypes ready for testing and, ironically, completed them by Nov. 11, 1918—the Great War's end." The round was put into use in the M1921 Browning machine gun. This gun was later developed into the M2HB Browning which with its .50 caliber armor-piercing cartridges went on to function as an anti-aircraft and anti-vehicular machine gun, with a capability of completely perforating 0.875 inches (22.2 mm) of face-hardened armor steel plate at 100 yards (91 m), and 0.75 inches (19 mm) at 547 yards (500 m). The concept of a .50 caliber machine gun was not an invention of this era; this caliber (.50 inch) had been used in Maxim machine guns and in a number of manual rapid-fire guns such as the original Gatling gun, although these were much lower power cartridges. During World War II the .50 BMG was primarily used in the M2 Browning machine gun, in both its "light barrel" aircraft mount version and the "heavy barrel" (HB) version on ground vehicles, for anti-aircraft purposes. An upgraded variant of the M2 Browning HB machine gun used during World War II is still in use today. Since the mid-1950s, some armored personnel carriers and utility vehicles have been made to withstand 12.7 mm machine gun fire, restricting the destructive capability of the M2. It still has more penetrating power than lighter weapons such as general-purpose machine guns, though it is significantly heavier and more cumbersome to transport. Its range and accuracy, however, are superior to light machine guns when fixed on tripods, and it has not been replaced as the standard caliber for Western vehicle-mounted machine guns (Soviet and CIS armored vehicles mount 12.7×108mm NSVs, which are ballistically similar to .50 BMGs). Decades later, the .50 BMG was chambered in high-powered rifles as well. The Barrett M82 .50 caliber rifle and later variants were developed during the 1980s and have upgraded the anti-materiel power of the military sniper. A skilled sniper can effectively neutralize an infantry unit by eliminating several targets (soldiers or equipment) without revealing his precise location. The long range (over one mile) between firing position and target allows time for the sniper to avoid enemy retaliation by either changing positions repeatedly, or by safely retreating. A common method for understanding the actual power of a cartridge is comparison of muzzle energies. The .30-06 Springfield, the standard caliber for American soldiers in both World Wars and a popular caliber amongst American hunters, can produce muzzle energies between 2,000 and 3,000 foot-pounds force (3,000 and 4,000 J). The .50 BMG round can produce between 10,000 and 15,000 foot-pounds force (14,000 and 20,000 J), depending on its powder and bullet type, as well as the weapon it is fired from. Due to the high ballistic coefficient of the bullet, the .50 BMG's trajectory also suffers less "drift" from cross-winds than smaller and lighter calibers, making the .50 BMG a good choice for high-powered sniper rifles. 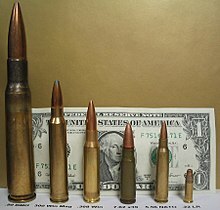 The .50 BMG (12.7×99mm NATO) cartridge has a capacity of 290 grains H2O (19 ml). The round is a scaled-up version of the .30-06 Springfield but uses a case wall with a long taper to facilitate feeding and extraction in various weapons. The common rifling twist rate for this cartridge is 1 in 15 in (380 mm), with eight lands and grooves. The primer type specified for this ammunition is a boxer primer that has a single centralized ignition point (US and NATO countries). However, some other countries produce the ammunition with Berdan primers that have two flash holes. The average chamber pressure in this round as listed in TM43-0001-27, the U.S. Army Ammunition Data Sheets — Small Caliber Ammunition, not including plastic practice, short cased spotter, or proof/test loads, is 54,923 psi (378,680 kPa). The proof/test pressure is listed as 65,000 psi (450,000 kPa). The .50 BMG cartridge is also produced commercially with a plethora of different bullets and to a number of different specifications. This tracer is used for observing fire, signaling, target designation, and incendiary purposes. This bullet has a red tip. This cartridge is used against personnel and unarmored targets. This bullet has an unpainted tip. This cartridge is used against lightly armored vehicles, protective shelters, and personnel, and can be identified by its black tip. This cartridge is used, in place of the armor-piercing round, against armored, flammable targets. The bullet has a silver tip. Tracer for observing fire, signaling, target designation, and incendiary purposes. Designed to be less intense than the M1 tracer, the M10 has an orange tip. Tracer for observing fire, signaling, target designation, and incendiary purposes. Can be fired from the M82/M107 series of rifles. This cartridge is used in place of the armor-piercing round against armored, flammable targets, with a tracer element for observation purposes. This cartridge is effectively a variant of the M8 armor-piercing incendiary with the added tracer element. Can be fired from the M82/M107 series of rifles. This bullet has a red tip with a ring of aluminum paint. Tracer for use in observing fire during air-to-air combat. Designed to be more visible, the M21 is three times more brilliant than the M1 tracer. This cartridge is used against unarmored, flammable targets. The tip of the bullet is painted blue with a light blue ring. This cartridge is used against personnel and unarmored targets. Can be fired from the M82/M107 series of rifles. This cartridge has a 355 – 360 gr (23.00 – 23.33 g) heavy metal (tungsten) penetrator that is sabot-launched at a muzzle velocity of 4,000 ft/s (1,219 m/s). The 0.50 in (12.7 mm) diameter sabot is designed to separate after leaving the muzzle, releasing the 0.30 (7.62 mm) penetrator. It is injection molded of special high strength plastic and is reinforced with an aluminum insert in the base section. The cartridge is identified by an amber sabot (Ultem 1000). For use only in the M2 series of machine guns. This round can penetrate 19 mm of steel armor at 1,500 yards (1,400 m). Like the M903, this is a SLAP round, with the only difference being that the M962 also has a tracer element for observing fire, target designation, and incendiary purposes. It has a red plastic sabot for identification, and is used only in the M2 series of machine guns. A long-range match cartridge specifically designed for long-range work using the M107 rifle. The .50 caliber M1022 has an olive green bullet coating with no tip ID coloration. The projectile is of standard ball design. It is designed for long-range sniper training and tactical use against targets that do not require armor-piercing or incendiary effects. It exhibits superior long range accuracy and is trajectory matched to MK211 grade A. The M1022 is ideal for use in all .50 caliber bolt-action and semi-automatic sniper rifles. The bullet remains supersonic out to from 1,500 m (1,640 yd) to 1,600 m (1,750 yd). A "combined effects" cartridge, the Mk 211 Mod 0 HEIAP cartridge contains a .30 caliber tungsten penetrator, zirconium powder, and Composition A explosive. It can be used in any .50 caliber weapon in the US inventory with the exception of the M85 machine gun. The cartridge is identified by a green tip with a gray ring. The .50 caliber Mk 257 API-DT has a purple bullet tip. The bullet has a hardened steel core and incendiary tip. It is used in the M2, M3, and M85. Dim trace reduces the possibility of the weapon being located during night fire and is visible only with night-vision devices. The .50 caliber Mk 265 has a black tip. The bullet has a hardened steel core. It is used in the M2, M3, and M85. as with the Mk 211 Mod 0, but with a tracer component. This cartridge likely can be used in any .50 caliber weapon in the US inventory with the exception of the M85 machine gun, as with the Mk 211 Mod 0. This cartridge is used against hardened targets such as bunkers, for suppressive fire against lightly armored vehicles, and ground and aerial threat suppression. It is generally fired either from pilot-aimed aircraft-mounted guns or anti-aircraft platforms, both produced by FN Herstal. It is identified by a gray over yellow tip. A tracer variant of it also exists. Created by the Naval Surface Warfare Center Crane Division, this cartridge uses M33 ball projectiles in polymer cases instead of brass. It has a clear polymer case, with a standard brass head fused at the bottom. The Mk 323 can be fired from M2HB/M2A1 machine guns and GAU-21/A aircraft guns with the same performance. It gives a 25 percent weight savings over brass-cased ammunition and allows 40 percent more ammunition to be carried for the same weight. The Mk 323's polymer casing is applied to tracer, AP, API, and SLAP projectiles. DARPA (Defense Advanced Research Projects Agency) contracted with Teledyne Scientific Company to develop the EXACTO program, including a .50-caliber guided bullet. Videos published by DARPA show the guided bullet diverting to strike a moving target. Two distinct and non-compatible metallic links have been used for the .50 BMG cartridge, depending upon the machine gun which will be firing the cartridges. The M2 and M9 links, "pull-out" designs, are used in the Browning M2 and M3 machine guns. Pull-out cloth belts were also used at one time, but have been obsolete since 1945. The M15-series "push-through" links were used in the M85 machine gun. The specified maximum diameter of an unfired .50 BMG bullet is 0.510-inch (13.0 mm); while this appears to be over the .50 inch (12.7 mm) maximum allowed for non-sporting Title I firearms under the U.S. National Firearms Act, the barrel of a .50 BMG rifle is only .50 inch (12.7 mm) across the rifling lands and slightly larger in the grooves. The oversized bullet is formed to the bore size upon firing, forming a tight seal and engaging the rifling, a mechanism which in firearm terms is known as swaging. Subject to political controversy due to the great power of the cartridge (it is the most powerful commonly available cartridge not considered a destructive device under the National Firearms Act), it remains popular among long-range shooters for its accuracy and external ballistics. While the .50 BMG round is able to deliver accurate shot placement (if match grade ammunition is used) at ranges over 1,000-yard (910 m), smaller caliber rifles produce better scores and tighter groups in 1,000-yard (910 m) competitions. In response to legal action against the .50 BMG in the United States and Europe, an alternative chambering was developed. The .510 DTC Europ uses the same bullet, but has slightly different case dimensions. .510 DTC cases can be made by fire-forming .50 BMG cases in a .510 DTC chambered rifle. The new round has almost identical ballistics, but because of the different dimensions, rifles chambered for .50 BMG cannot fire the .510 DTC, and therefore rifles chambered for .510 DTC do not fall under many of the same legal prohibitions. Barrett offers a similar alternative, the .416 Barrett, which is based on a shortened .50 BMG case necked down to .416 caliber (10.3 mm). A 1999 Justice Department Office of Special Investigations briefing on .50 caliber rifle crime identified several instances of the .50 BMG being involved in criminal activities. Most of the instances of criminal activity cited in the Office of Special Investigations briefing involved the illegal possession of a .50 BMG rifle. The briefing did not identify any instance of a .50 BMG rifle being used in the commission of a murder. In the United States, Washington, D.C. disallows registration of .50 BMG rifles, thus rendering civilian possession unlawful. California prohibits the private purchase of a rifle capable of firing the .50 BMG through the .50 Caliber BMG Regulation Act of 2004. Connecticut specifically bans the Barrett 82A1 .50 BMG rifle. However, .50 BMG rifles registered prior to the enacted bans remain lawful to possess in California and Connecticut. Maryland imposes additional regulations on the sale and transfer of .50 BMG rifles and other "regulated firearms," and limits purchases of any firearm within this class to one per month, but does not impose registration requirements or any form of categorical ban. Within the United Kingdom, it is legal to own a .50 BMG rifle with a section 1 Firearms Certificate. Applications requesting firearms in this caliber are not subject to any extra scrutiny compared to smaller calibers. Contrary to a persistent misconception within the United States Armed Forces, using .50 BMG in a direct antipersonnel role is not prohibited by the laws of war. Writing for the Marine Corps Gazette, Maj Hays Parks states that "No treaty language exists (either generally or specifically) to support a limitation on [the use of .50 BMG] against personnel, and its widespread, longstanding use in this role suggests that such antipersonnel employment is the customary practice of nations." Parks theorizes that the misconception originated in historical doctrine discouraging the use of the M8C spotting rifle—an integral .50-caliber aiming aid for the M40 recoilless rifle—in the antipersonnel role. This limitation was entirely tactical in nature and was intended to hide the vulnerable M40 and its crew from the enemy until the main anti-tank gun was ready for firing; however, Parks concludes that some personnel assumed the existence of a legal limitation on the use of .50-caliber projectiles more generally. The primary military use of this round is in the Browning M2HB heavy machine gun. The U.S. Coast Guard uses .50 BMG rifles to disable outboard engines from armed helicopters during interdictions. Similarly, .50 BMG weapons have attracted attention from law enforcement agencies; they have been adopted by the New York City Police Department as well as the Pittsburgh Police. A .50 BMG round can effectively disable a vehicle when fired into the engine block. If it is necessary to breach barriers, a .50 BMG round will penetrate most commercial brick walls and concrete cinder blocks. The .50 BMG round has been used as a sniper round as early as the Korean War. The former record for a confirmed long-distance kill was set by U.S. Marine sniper Carlos Hathcock in 1967, at a distance of 2,090 meters (2,290 yd; 1.30 mi); Hathcock used the .50 BMG in an M2 Browning Machine Gun equipped with a telescopic sight. This weapon was used by other snipers, and eventually purpose-built sniper rifles were developed specifically for this round. In June 2017, a McMillan Tac-50 was used by a sniper with Canada's Joint Task Force 2 to kill an Islamic State insurgent in Iraq, setting the world record for the longest confirmed kill shot in military history at 3,540 meters (3,870 yd; 2.20 mi). Before that record, Canadian Army Corporal Rob Furlong of the PPCLI achieved what was then the longest-range confirmed sniper kill in history when he shot a Taliban combatant at 2,430 meters (2,660 yd; 1.51 mi) during the 2002 campaign in the Afghanistan War. This was surpassed in 2009 by a British sniper in Afghanistan with 2,475 meters (2,707 yd; 1.538 mi) using a .338 Lapua Magnum (8.58×70 mm) rifle. In addition to long-range and anti-materiel sniping, the U.S. military uses .50 BMG weapons to detonate unexploded ordnance from a safe distance. It can disable most unarmored and lightly armored vehicles. Some civilians use .50 caliber rifles for long-range target shooting: the US-based Fifty Caliber Shooters Association holds .50 BMG shooting matches. ^ a b "C.I.P. TDCC sheet 50 Browning" (PDF). ^ "50 BMG 750 gr A-MAX Match". Hornady. Archived from the original on October 15, 2016. Retrieved October 8, 2016. ^ Sweeney, Patrick (December 21, 2015). Gun Digest Book of Suppressors. Iola, Wisconsin: F+W Media. p. 177. ISBN 978-1-4402-4540-4. ^ a b c Skinner, Stan (November 20, 2013). Shooter's Bible Guide to Extreme Iron. Skyhorse Publishing Company, Incorporated. p. 172. ISBN 978-1-62873-538-3. ^ Dunlap, Roy F., Ordnance Went Up Front, Samworth Press (1948), pp. 311–312. ^ Barnes, Frank C., Cartridges of the World, U.S. Army .50 BMG Cartridge Specifications, DBI Books (1989), ISBN 978-0-87349-033-7, p. 432. ^ Michaelis, Dean (March 1, 2000). The Complete .50-caliber Sniper Course: Hard-Target Interdiction. Boulder, Colorado: Paladin Press. pp. 26–34. ISBN 978-1-58160-068-1. ^ "Army Ammunition Data Sheets for Small Caliber Ammunition" (PDF). Defense Technical Information Center. April 1994. p. 150. Retrieved August 27, 2010. ^ "albums/oo255/FEDE_EL_SOMALI/1-15". i381.photobucket.com. Retrieved July 28, 2014. 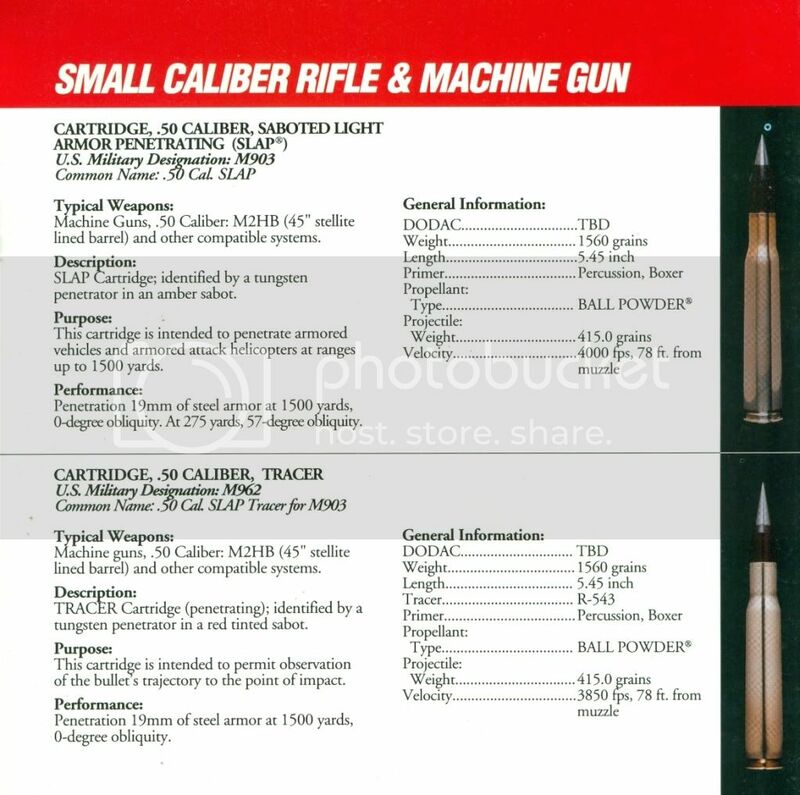 ^ a b "Small Caliber Ammunition" (PDF). ATK. Retrieved August 27, 2010. ^ Crane Using Lightweight .50 Cal Ammo - Kitup. Military.com, September 11, 2011. ^ Jarod Stoll and Kathryn Hunt (May 21, 2012). "Advancements in Lightweight .50 Caliber Ammunition" (PDF). Archived from the original (PDF) on July 19, 2013. Retrieved July 28, 2014. ^ Cox, Matthew (December 15, 2014). "DoD Wants Bullet That Can Change Direction After Being Fired". Military.com. Retrieved April 11, 2016. ^ "EXACTO Guided bullet demonstrates repeatable performance against moving targets 2904152 | weapons defence industry military technology UK | analyse focus army defence military industry army". Armyrecognition.com. April 29, 2015. Retrieved April 11, 2016. ^ "EXACTO Guided Bullet Demonstrates Repeatable Performance against Moving Targets". Darpa.mil. April 27, 2015. Retrieved April 11, 2016. ^ "EXACTO Live-Fire Tests, February 2015". DARPAtv. April 27, 2015. ^ GunWeek.com. "SHOT Show 2006 New Rifles, Shotguns, Pistols Offer Enhanced Performance". Archived from the original on May 21, 2008. Retrieved April 10, 2008. ^ General Accounting Office (August 4, 1999). "Weaponry: .50 Caliber Rifle Crime," GAO Office of Special Investigations letter" (OSI-99–15R). ^ "District of Columbia Code". ATF. Retrieved October 4, 2018. ^ a b c d "Machine Guns & 50-Caliber". lawcenter.giffords.org. Giffords Law Center. 2018. Retrieved October 5, 2018. ^ "Assembly Bill No. 50". CA Legislature. Retrieved October 4, 2018. ^ "CHAPTER 943 OFFENSES AGAINST PUBLIC PEACE AND SAFETY". Connecticut General Assembly. Retrieved October 4, 2018. ^ Shouse, Neil (July 17, 2017). "Are .50 BMG rifles legal in California?". www.shouselaw.com. Shouse California Law Group. Retrieved October 5, 2018. ^ "Home". Fifty Calibre Shooters Association UK. Retrieved July 28, 2014. ^ Parks, Maj W. Hays (January 1988). "Killing A Myth". Marine Corps Gazette. Archived from the original on February 28, 2014. Retrieved February 20, 2014. ^ Senich, Peter R. (1993). U.S. Marine Corps Scout-sniper: World War II and Korea. Boulder: Paladin Press. pp. 225–227. ISBN 978-0-87364-710-6. ^ Henderson, Charles (2003). Silent Warrior (2003 ed.). Berkley Books. p. 181. ISBN 978-0-425-18864-4. ^ FIFE, ROBERT (June 21, 2017). "Canadian elite special forces sniper makes record-breaking kill shot in Iraq". Retrieved June 23, 2017. ^ Michael Friscolanti (May 15, 2006). "Friscolanti, Michael (May 15, 2006). "We were abandoned", Macleans 119 (20)". Macleans.ca. Archived from the original on February 24, 2011. Retrieved August 27, 2010. ^ Michael Smith (May 2, 2010). "Hotshot sniper in one-and-a-half mile double kill". The Sunday Times. UK. Retrieved August 27, 2010. ^ Michael Sheridan (May 3, 2010). "British sniper Craig Harrison (The Silent Assassin) breaks record, kills target from 1.5 miles away". Daily News. New York. Archived from the original on October 18, 2010. Retrieved August 27, 2010. ^ Cutshaw, Charles Q. (February 28, 2011). Tactical Small Arms of the 21st Century: A Complete Guide to Small Arms From Around the World. Iola: Gun Digest Books. pp. 322–323. ISBN 978-1-4402-2709-7. ^ a b "Serbu BFG-50". Archived from the original on August 28, 2018. Retrieved February 6, 2019. ^ "Arms Tech Ltd. TTR-50". ^ "Bushmaster Firearms". Bushmaster Firearms International. Archived from the original on July 18, 2011. Retrieved September 3, 2011. ^ "M96 .50 Cal BMG". E.D.M. Arms. Retrieved August 27, 2010. ^ Chris L. Movigliatti. "A.M.S.D. Sa". Amsd.ch. Archived from the original on September 13, 2010. Retrieved August 27, 2010. ^ "PT. Pindad (Persero) - Home". pindad.com. Retrieved July 28, 2014. ^ "RAMO DEFENCE M650 and M600". Securityarms.com. Archived from the original on September 5, 2010. Retrieved August 27, 2010. ^ "Serbu BFG-50a". Archived from the original on August 16, 2017. Retrieved February 6, 2019. ^ "Serbu RN-50". Archived from the original on February 27, 2018. Retrieved February 6, 2019.